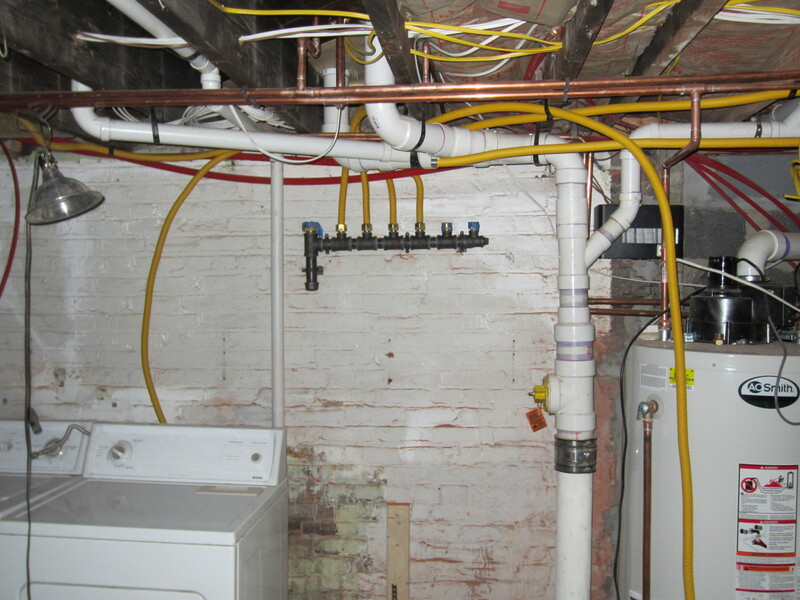 One of the advantages of our basement demolition and excavation efforts was to clear out decades of plumbing, hydronics, and electrical (especially electrical – we had three generations of technology down there, from some original knob-and-tube, to wire conduit, to Romex), and start anew with a basement utility hub that wouldn’t eventually burn down the house. 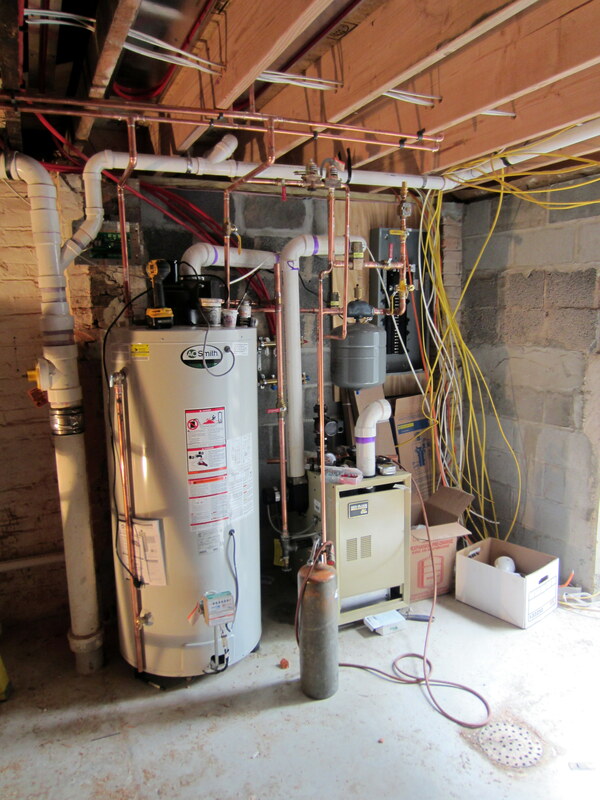 The additional benefit of the excavation of the southeast crawlspace, specifically, was to allow the boiler (which would supply hot water to the radiators and heated floors), the hot water heater, and the electrical panel to be consolidated in one area of the basement. This would allow maximum utilization of the remaining area. 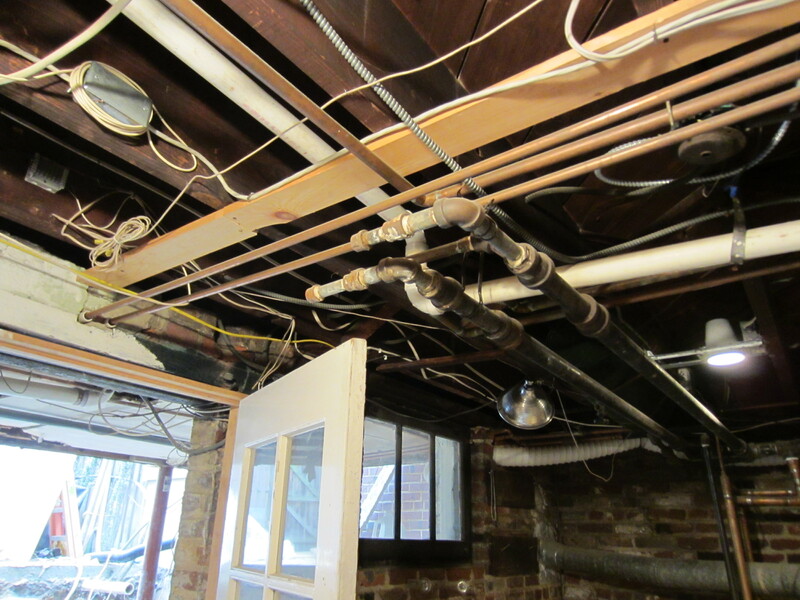 This crawlspace area was barely usable in the pre-reno house. 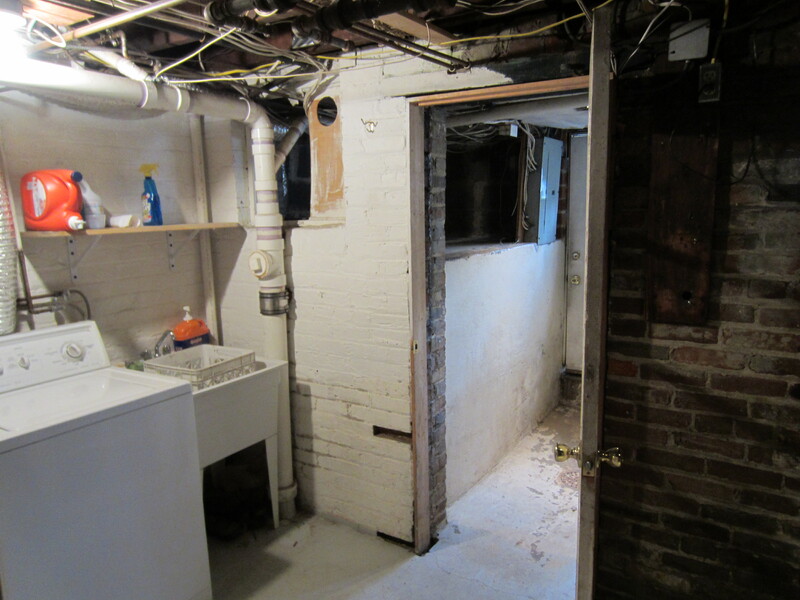 Some pics of the basement before are provided below. This is an even better picture of the mayhem that lay dormant in our basement. 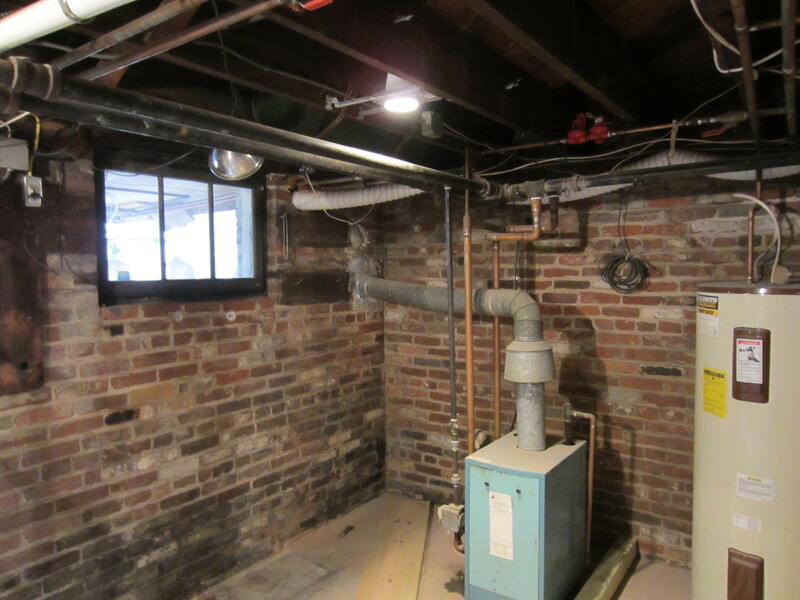 Looking through the doorway, you’ll see the old electrical panel, located in the quasi-exterior area in the basement. 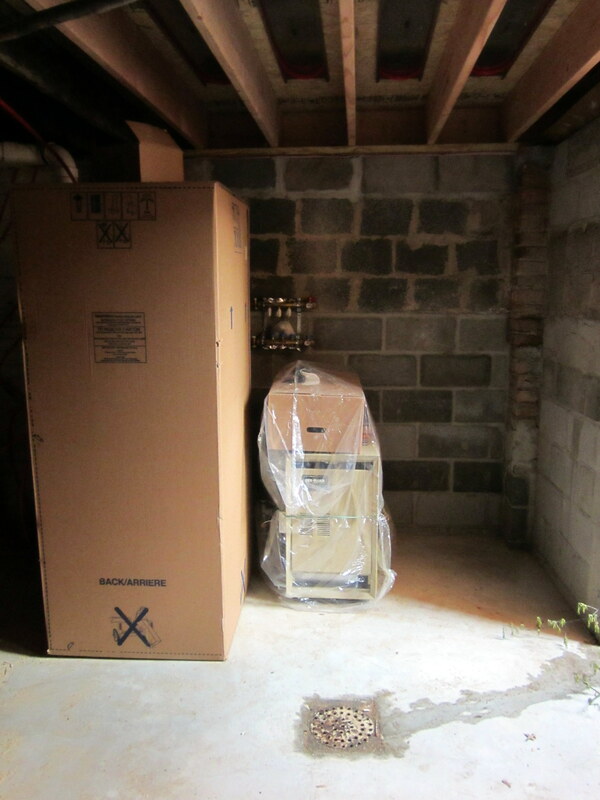 Note the crawlspace area between the door and the panel – previously of limited use, this will be the home of the new home utility hub. 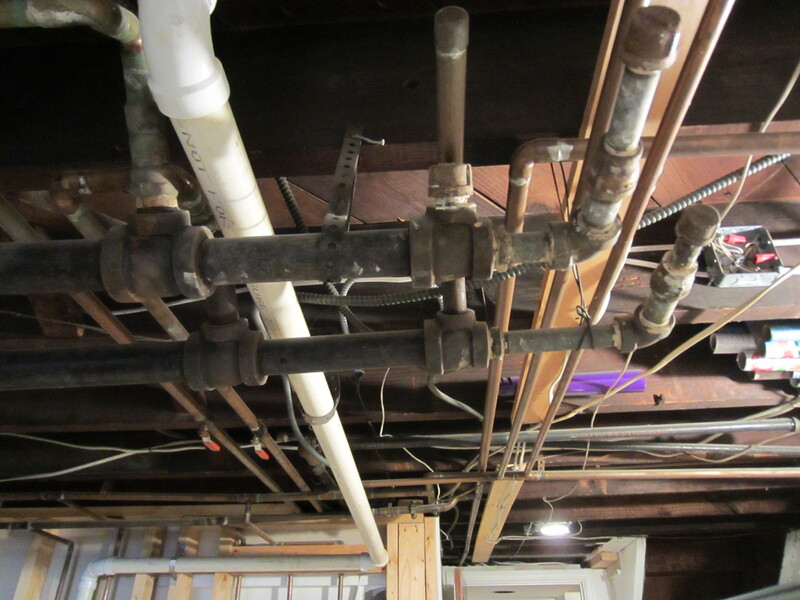 The plumbing stack in front will remain where it is (as seen in https://wolfestreetproject.com/2012/04/09/insane-in-the-main-drain/). All of this came to a satisfying end with the demo work. Our contract with the GC specified that everything down here would be eliminated and reinstalled and replumbed and rewired anew . . . These elements will actually be located in the space that previously was occupied by crawlspace, so, bonus in space utilization, eh? 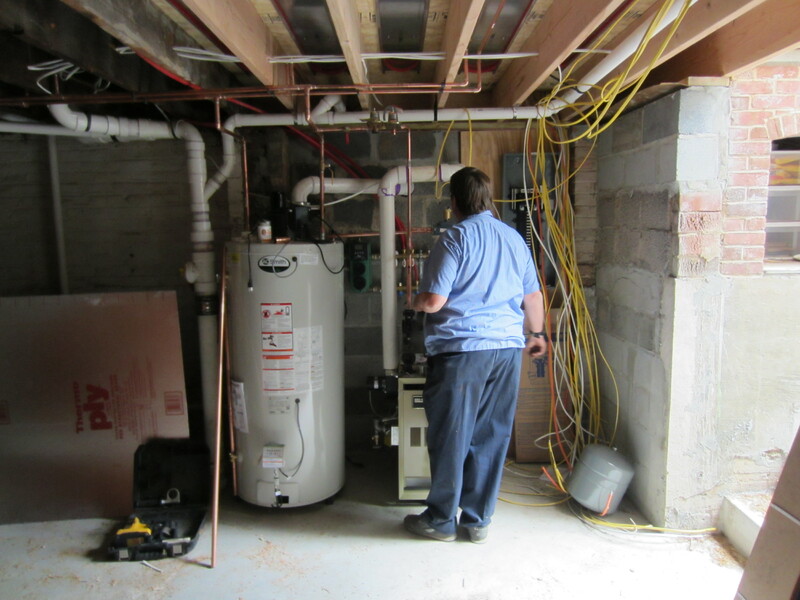 To the right of the boiler and water heater will reside the “heavied-up” electrical panel (from 100 to 200 amps) to support more electrical. At this point, it’s just the termini of a bunch of electrical cables. 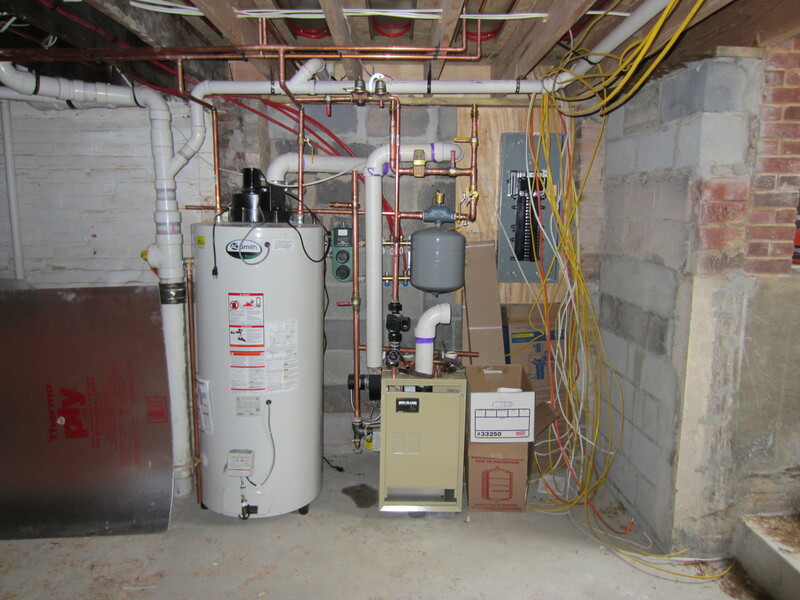 Here’s a photo of the water heater and boiler after initial installation. There’s a lot more to go before this area is complete, including installation of the electrical panel, which is still AWOL at this point. The grey canister is the new expansion tank, which previously was a large, green drum about 5x the size that hung from the joists above the work bench. The old tank needed to be drained periodically, and so we’d have to screw a hose onto it and run the hose across the basement to the utility sink. The worst part was that there was no venting on the drum, so the water that had built up would drain for hours. The new expansion tank has a rubber bladder inside that contracts when water needs to escape from the hydronic lines, then expands to expel it back again when the expansion need abates. No muss, no fuss. Another new development at this stage is installation of the electrical panel (sans connections). 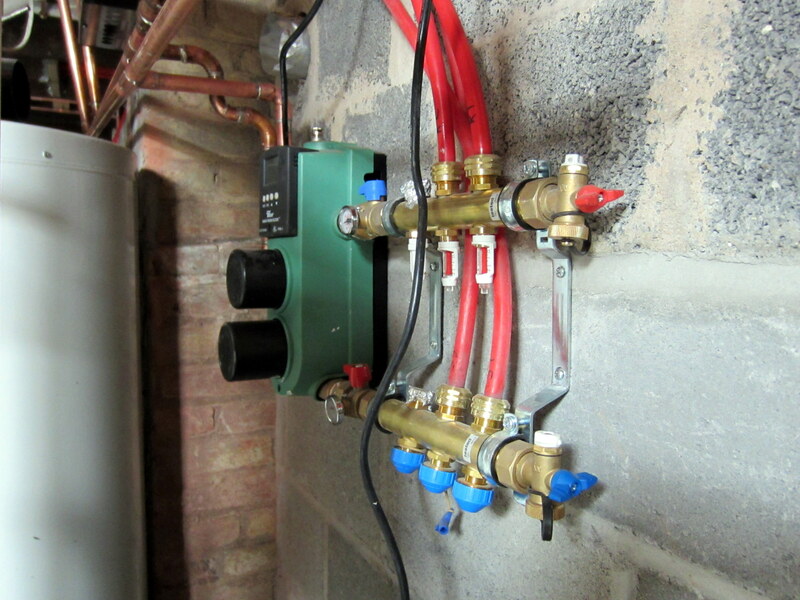 This is what’s lurking behind there – a manifold to route hot water from the boiler to three zones in the house. At this point, there’s only a few lines coming off it, but it’s going to get really crowded. 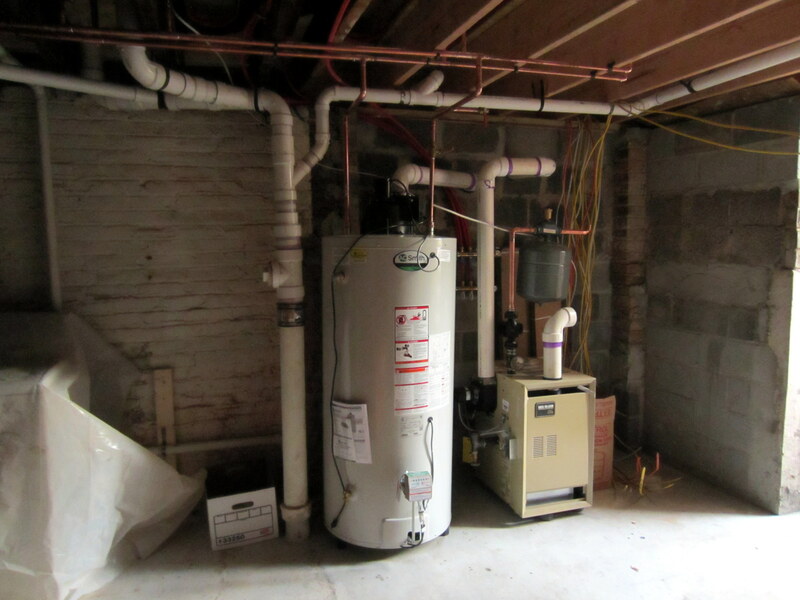 The basement, heated by radiators in the office area and in the unfinished area. In addition to controlling the radiant heat (as well as the AC) via thermostats on each floor, there are failsafe controls directly on the trunk lines for hot water heading into each zone. 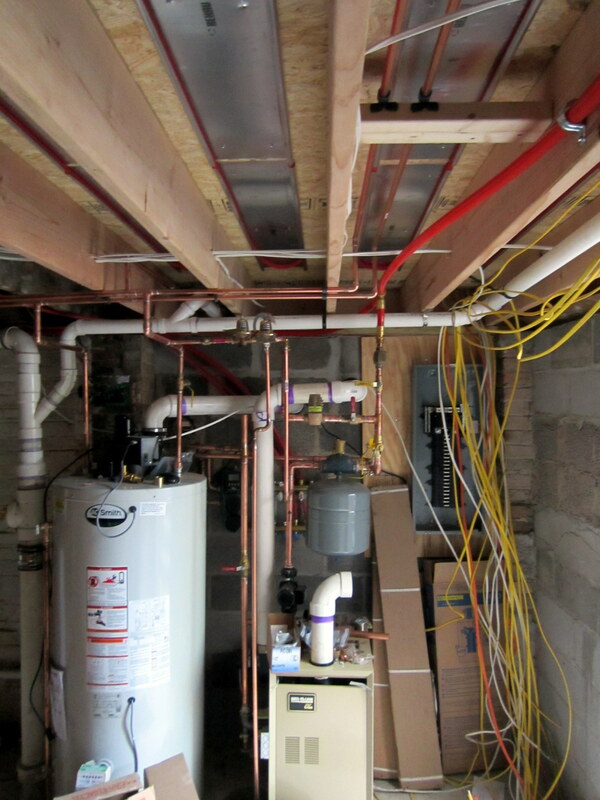 These three brass, manual controls can be seen on top of the copper pipes in front of the PVC drain line and above the expansion tank. 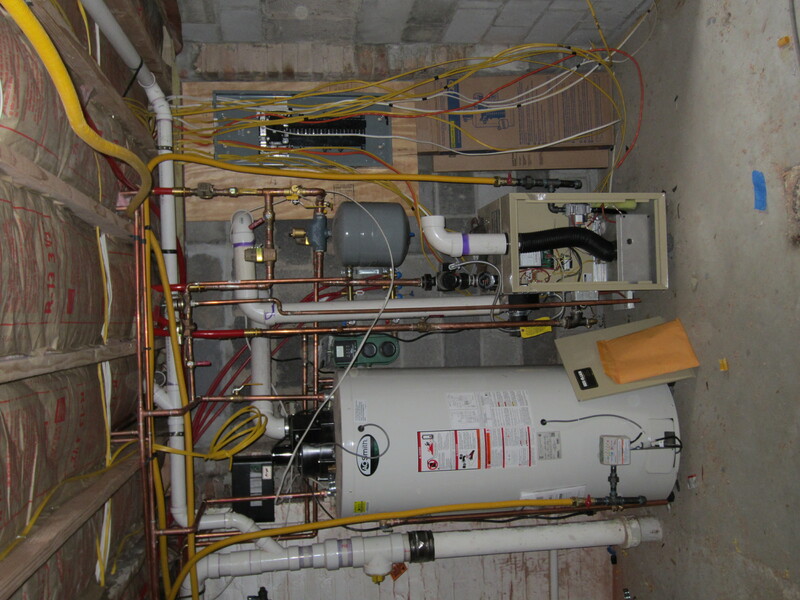 The red tubing feed two types of radiant head elements – radiators (before which they are connected to copper pipes) and under-floor heating. In the photo below, you can see some of this latter heating approach. Here’s a view of the actual heating elements. 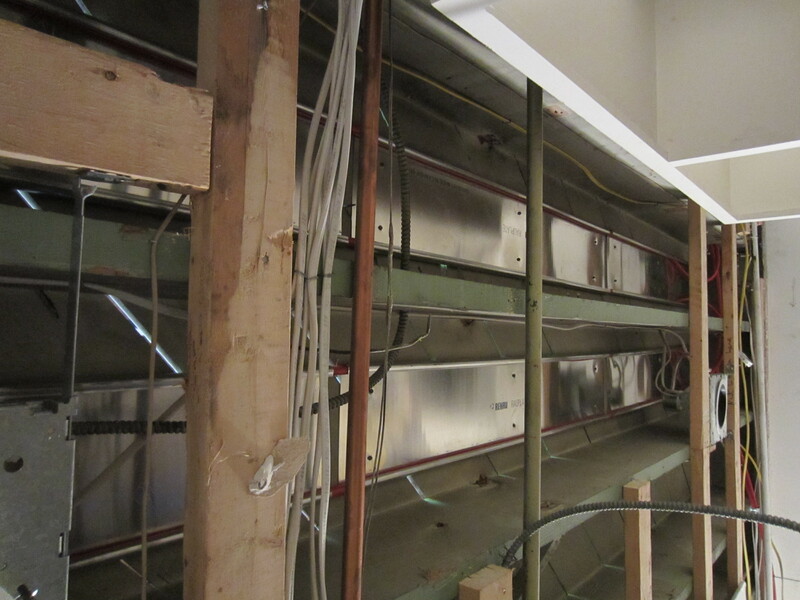 Insulation beneath the radiant elements will be installed later, with a reflective side against the metal plates. This is pretty much the apex of hydronic lines. 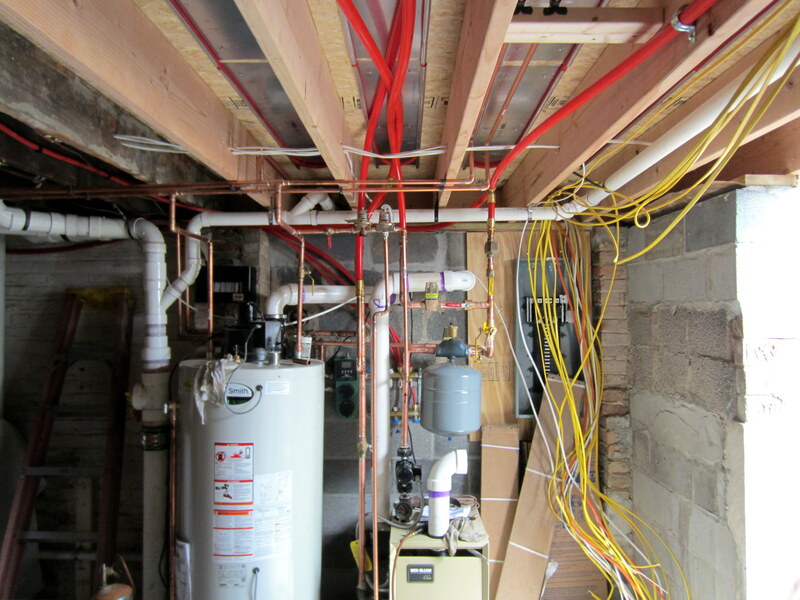 The red ones heading up in the photo are supply and return lines for the master bedroom radiator and under-floor heating in the kitchen. 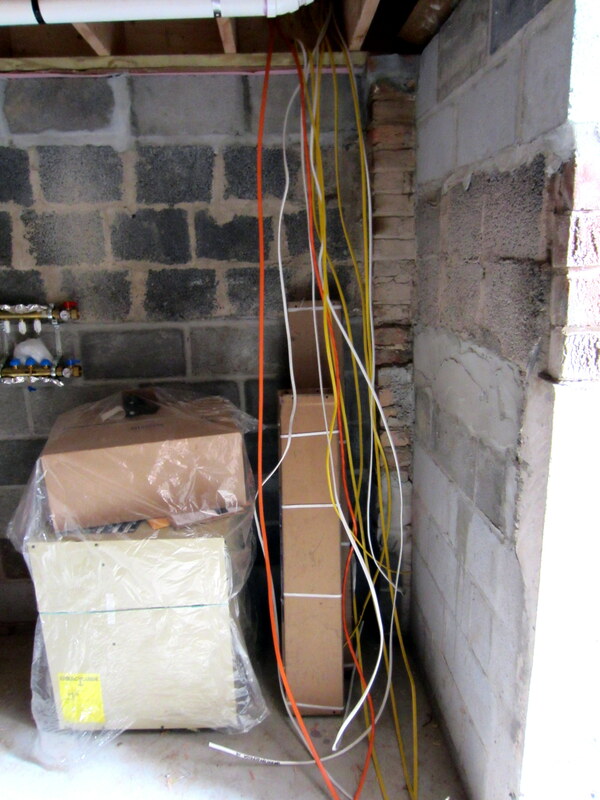 The yellow gas lines shortly thereafter began to infiltrate the basement. Here’s a shot after the lines were run off the manifold. 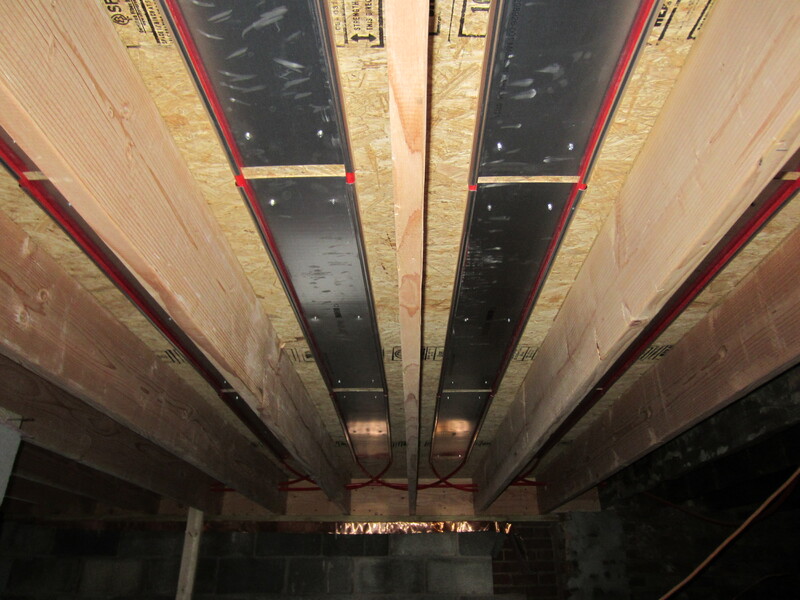 In addition to the new lines, insulation in the first-floor joist bays has been complete at this point. The area’s dense with equipment, electrical lines, hydronic lines, and gas lines, now that the basement utilities have reached critical mass, but we’re happy it’s all in once place, compartmentalized from the rest of the newly excavated area (which will allow for storage of more bikes, of course . . .).